Today the Executive Body for the Convention on Long-range Transboundary Air Pollution (LRTAP) concluded its thirtieth session, held from 30 April to 4 May 2012 in Geneva, adopting historic amendments to the Convention’s 1999 Gothenburg Protocol to Abate Acidification, Eutrophication and Ground-level Ozone (Gothenburg Protocol). Following years of wide-ranging and intense negotiations, the new text of the Protocol will now include national emission reduction commitments for main air pollutants to be achieved in 2020 and beyond. The revised Protocol will include — for the first time — emission reduction commitments for fine particulate matter, the pollutant whose ambient air concentrations notoriously exceed air quality standards throughout Europe. Fine particulate matter includes both solid particles and liquid droplets found in air that are less than 2.5 micrometres in diameter. Also referred to as “respirable” particles, because they penetrate deep into the respiratory system, adverse health effects have been associated with exposure to fine particulate matter over both short periods (such as a day) and longer periods (a year or more). Health effects of fine particles include coughing or difficulty breathing; chronic bronchitis; and premature death in people with heart or lung disease. Fine particulate matter is also responsible for environmental effects such as corrosion, soiling, damage to vegetation and reduced visibility (haze). Moreover, the Parties have broken new ground in international air pollution policy by specifically including the short-lived climate forcer, black carbon (or soot), as a component of particular matter. Black carbon is known as a short-lived climate forcer, because it has a strong warming effect but does not persist in the atmosphere as long as carbon dioxide (CO2), the main focus of emissions-cutting targets until now. However, more recent research shows that black carbon is 680 times more heat trapping than CO2. Thus, in particular in the global context of glacier melting, reduced ice mass at the Poles, with the knock-on effects on flora and fauna and sea level rise, curbing black carbon emissions is a critical objective in tackling climate change. 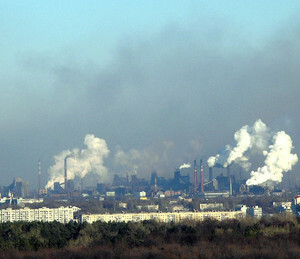 In addition to ceilings on fine particulate matter, several of the Protocol’s technical annexes were revised with updated sets of emission limit values (emission standards) for both key stationary sources of air pollution (such as factories and processing plants) and mobile sources (such as vehicles and non-road mobile machines and agricultural and forestry tractors). 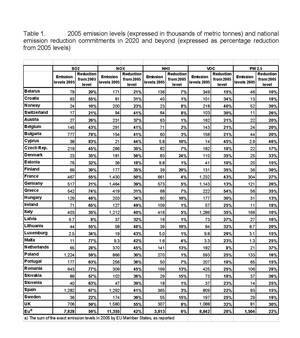 National emission reduction commitments and emission levels for 2005 for the 27 member States of the European Union, as well as for Belarus, Croatia, Norway and Switzerland are shown in the table1 below. Other LRTAP Parties that intend to become members of the revised Protocol – notably Canada, the United States, the Russian Federation and countries in Southern and Eastern Europe, the Caucasus and Central Asia – will need to provide their respective 2005 data and commitments figures upon ratification of or accession to the amended Protocol. EU as a whole is going to reduce its emissions of sulphur dioxide, nitrogen dioxide, ammonia, volatile organic compounds and PM2.5 by 59, 42, 6, 28 and 22%, respectively. The United States provisionally indicated that it is aiming for a level of ambition similar to that of the EU, with respect to its reduction commitments. Climate Change is a global and long-term problem, but combating it can be also successfully done on shorter time scales and through implementing abatement policies on a regional scale first and then in other regions. Furthermore, with a membership that spans the planet surface — from Europe to the Russian Federation, from Central Asia to Canada and from the United States to Turkey — the new revisions to the UNECE Air Convention will have a major global impact. One of the Convention’s priorities is to provide assistance to countries in Southern and Eastern Europe, the Caucasus and Central Asia in ratifying and implementing various protocols under the Convention. The revised Gothenburg Protocol includes specific provisions on flexibilities to implement emission standards for these countries that should facilitate the ratifications and implementation of the Protocol. For example, a Party - a newcomer to the Protocol - may declare upon ratification of the amended Protocol that it will extend any or all of the specified timescales for application of the emission limit values. Depending on the emission source or pollutant, this so called grace period may be extended up to 5-15 years after the date of entry into force of the Protocol for the Party in question. For new stationary sources the application timescale will be one year. The Convention on Long-range Transboundary Air Pollution addresses some of the major environmental problems of the UNECE region through scientific collaboration and policy negotiation. Created in 1979, the Convention is extended by eight protocols that identify specific measures to be taken by Parties to cut their emissions of air pollutants. Parties develop policies and strategies to combat the discharge of air pollutants through exchanges of information, consultation, research and monitoring. The 1999 Gothenburg Protocol to Abate Acidification, Eutrophication and Ground-level Ozone entered in to force in 2005. The Protocol sets emission ceilings for pollutants such as sulphur and nitrogen oxides, non-methane volatile organic compounds and ammonia. The Protocol also sets tight limit values for specific emission sources (e.g., combustion plant, electricity production, and vehicles) and requires best available techniques to be used to keep emissions down. Short-lived climate forcers (SLCFs) are substances like black carbon, troposheric ozone and methane that have relatively short lifetimes in the atmosphere ranging between days and weeks (black carbon and ozone) and up to several years (methane) and which contribute to global warming by negatively influencing Earth’s radiative budget through absorption of solar radiation. Moreover, black carbon when deposited on ice and snow fields reduces surface albedo and thus increases absorption of solar radiation by the surface.